What if you had a secure, open platform that connects all your tools in the cloud, allowing you to pull together best-of-breed technologies that fit your unique business needs? These native integrations keep teams happy and give IT full visibility and control, while boosting productivity and collaboration across the entire organization. 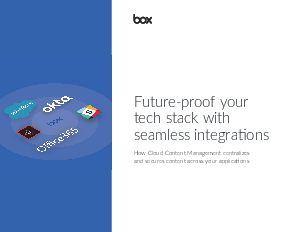 Download our ebook to see how Cloud Content Management from Box provides you with a central and secure content layer that unites all of your apps with seamless, native integrations. In it, you'll learn about our most popular integrations — like Microsoft Office 365, Okta, Slack and Salesforce — and how Box helps you future-proof your tech stack while also providing a unified experience for employees and the extended enterprise.